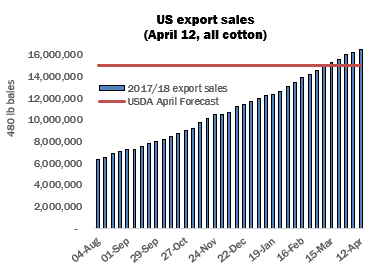 The net addition of 290,200 running bales of upland and 4,900 of Pima raised this season’s all-cotton export sales by April 12 to the equivalent of approximately 16.47 million bales (480 lbs), against USDA’s latest forecast of 15,000,000. By the date in question, 42 percent of sales had still to be shipped. Some observers were surprised to see China feature in yesterday’s report as the single largest destination for the week in question, given the prevailing trade tensions and the threat of a sharp increase in the import tariffs levied on US cotton. 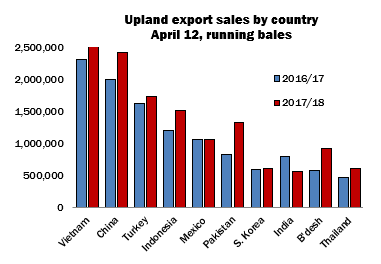 This season’s upland sales to China are over 21 percent ahead of those at the same point in 2016/17, while those to Vietnam (the largest market) show an increase of 24 percent. Of the top ten export markets for US cotton, only India shows a downturn in relation to last season.